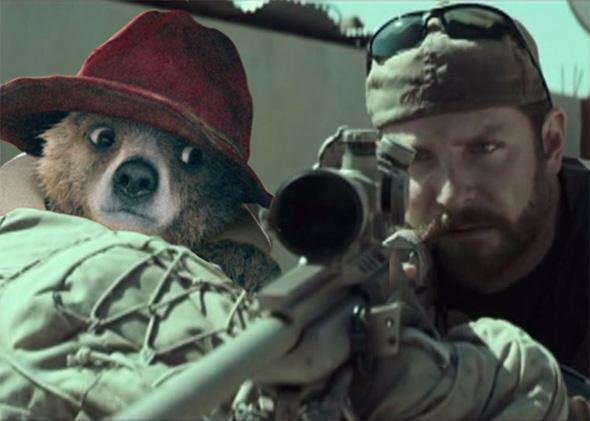 Free speech: University of Michigan flip-flops on its decision to screen Paddington instead of American Sniper. Michigan’s film flip-flop reveals how campuses struggle to embrace free speech without offending students. Photo illustration by Slate. Film stills courtesy StudioCanal and Warner Bros. Pictures. The University of Michigan temporarily canceled a screening of the film American Sniper this week, after more than 200 students signed a letter saying that the movie perpetuates “negative and misleading stereotypes” and creates an unsafe environment for Middle Eastern, North African, and Muslim students. The film, scheduled for Friday, was to be replaced with a screening of Paddington, a family movie based on the popular series of British children’s books about a talking bear with a love of marmalade. The university reversed its decision late Wednesday, saying “it was a mistake” to cancel the showing. American Sniper is being shown as part of the university’s Center for Campus Involvement’s UMix Late Night, a weekly mixer of sorts that usually includes activities such as movies, games, and crafts. On Tuesday, after receiving the letter from the concerned students, the center announced that it was pulling the film from Friday’s event. Earlier Wednesday, the center said it would still screen American Sniper but in a “separate forum that provides an appropriate space for dialogue and reflection” about the film. In the wake of the reversal Wednesday night, it is Paddington that will now be shown in a different location, Harper said, to provide students with additional options. American Sniper tells the story of Chris Kyle, a member of a Navy SEAL team frequently referred to as the deadliest sniper in U.S. history. The author of a best-selling memoir, Kyle was revered by many as a hero and despised by others as a racist. The film based on his memoir was similarly polarizing. Directed by Clint Eastwood and starring Bradley Cooper, American Sniper was a box office hit and earned several Academy Award nominations. But some critics decried it as dangerous propaganda. The letter signed by Michigan students and its Muslim Student Association falls into the latter camp. It stated that the movie “sympathizes with a mass killer.” It also referenced the recent killing of three Muslim students near the University of North Carolina at Chapel Hill. Compared with previous UMix events, the Iraq war drama does appear to be anomalous to the mixer’s usual programming. UMix is typically a time for indulging in childhood nostalgia and free food. Past film screenings include the Disney Channel movie Halloweentown, the comedy Horrible Bosses 2, and the fantasy adventure The Hobbit. The screening of American Sniper will be paired with inflatable laser tag and a Build-a-Bear workshop. The incident is the most recent in a pattern of student complaints prompting event cancellations, including that of commencement addresses, concerts, and plays. Colleges are increasingly finding themselves trying to balance the concerns of their students—in particular, those who are marginalized—and the idea that campuses are places for open dialogue and expression, no matter how offensive. So pressing is the issue to college presidents that when Mark Schlissel became president of Michigan last year, he devoted a large portion of his inaugural address to discussing what he called self-censorship. In the address, Schlissel reminded students that Ross Barnett, the former segregationist governor of Mississippi, once stood on the same stage he was standing on now.